As a politically active being, doesn’t man need commitment to a group, a commitment that can then to a certain extent be called love? On this note, Arendt says that the “act” of “joining or forming” a group is “something completely different” from the “natural condition.” And in doing this, one enters the world: “The kind of organizations (one forms or joins) has to do with a relation to the world.” But in contrast to this, both love and friendship are not worldly. They are more natural, and, by her clock, less important. She notes the worldlenssness of love in The Human Condition when she writes of the Christian “political principle” which is a “bond of charity between people”(53). This founds a “public realm of its own” but is “worldless” because it is based on love. Arendt goes so far, over there, to say that this “bond” “is admirably fit to carry a group of essentially worldless people through the world, a group of saints or a group of criminals, provided it is understood that the world itself is doomed” and that every act is provisional. As she points out there, this is antithetical to the Greek (pre-Platonic) understanding of action and it’s relationship with the world. Hearing this, Gaus makes a smart move and asks her what was “lost” in this transition from (for lack of a better word) “partial worldlessness” to political worldliness (with the founding of the Jewish State). This, to be sure, is a sharp question because, as I have pointed out in the last blog entry (and above), Arendt prefers political worldliness to apolitical worldlessness in The Human Condition. In fact, we find no such lamentation of loss there. 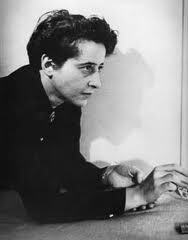 And in her essay on the “Jew as Pariah” – as well as on her work on Rahel Varnhagen – Arendt notes that Rahel, like other schlemiels, clung to “such universal things as the sun, music, trees, and children.” In other words, they clung to nature (to their primary birth) but not to history and politics (a second birth they couldn’t experience). Although Arendt’s words on Varnhagen, Heinrich Heine, and Charlie Chaplin (amongst others) seem to be charming, they are ultimately for the dustbin of history. She doesn’t want to go back. She may find the worldlessness of Jews and Christian communities to have their charm, but their loss is what she ultimately calls the “price for freedom.” And, for her, that price is paid with the founding of Israel as a Jewish State. Regardless of what she says, however, I think that Arendt is missing something. In her formulation, all worldlessness must be sacrificed in the name of the world and politics. But can worldlessness ever be sacrificed? Is the worldlessness of the Jews – which she thinks of as a thing of the past – gone? If that is the case, why do we find so many Jewish-American writers, filmmakers, and comedians – after the founding of Israel – drawing on it in their schlemiel routines? Are Arendt’s formulations of Jewish worldlessness and the end of such worldlessness too extreme and intolerant of any possibility of being both worldless and worldly at the same time? Or is (political) history the ultimate judge? And is the price unmistakable? « Does Hannah Arendt’s Reading of “The Human Condition” Pass or Fail the Schlemiel Test? nice post. i’d add though that Arendt also called that old worldless Jewish world “beautiful.” as for American Jews, maybe the schlemiel figures prominently at that historical moment just prior to their second birth and complete emergence into the larger American public-political world. the schlemiel insofar as he or she continues to exist does so as a relic or a cliche that refers back to the age the classical American Jewish Schlemieldom of Philip Roth and Woody Allen. Sarah Silverman does that well, whereas Jeffery Golblum is far more an integrated persona, very comfortable, more loose lanky, and fluid than short, jerky, and awkward.